The flag is obviously The Saltire, flying on the bow staff of the Calmac ferry. While it is flying there every day this Sunday it should be flying in many more places. 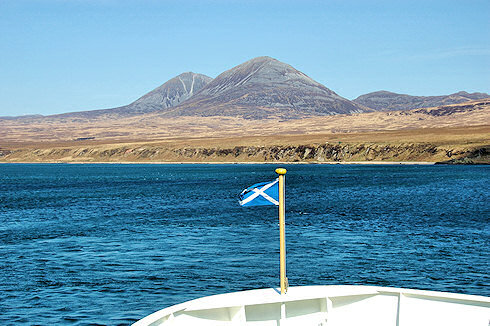 On many days the Paps of Jura are covered in clouds, so here's the first instalment of a few nice views of them on a clear and sunny day. This one is from the ferry as it is just leaving from the pier in Port Askaig, about to turn south to travel along the Sound of Islay.